Ruffian, on that Jewish thingy. First off, I fully support your call to have Obama drawn and quartered, then tortured to death. Interestingly, I would advocate the same for the current Israeli leader, who is every bit as evil. There's nothing "harsh" about it. Try not to forget that all of these war crimes are a collaboration between England, the US, and Israel. The intelligence agencies of these countries have coordinated the entire war on terror, and war crimes against humanity across the globe. As far as I'm concerned "The Chosen Ones" have been a curse on humanity since their inception. Since The Donald seems to be best buddies with Benjamin, Obama taking the other side is just typical political theater at its finest. They have to pretend to be enemies. Don't you know it's just part of the deception? With all the legislation Obama has been signing in the past few weeks, you would think he never plans on leaving, especially considering Trumps vow to rescind everything Obama did as soon as he assumes office. Things are definitely not as they appear. Regarding the camera's struggles with light contrast, when objects are lit directly from the sun, should stars be visible or not? Look too, in the last two pics, whether the earth's atmosphere adds a glow round the earth, or not. Just food for thought. Some have stars, and some don't. Seriously, who built the moon buggy in picture 4? I don't recognize it. It might even be a still from a movie. As before, just raising the topic to tease out clarification of what ought to be expected from an authentic picture, and what shouldn't be there. The first pic is the extremely famous well-published REAL picture of the first un-tethered space-walk by Dave McCandless. Notice his elaborate propulsion device extending from around back. NOTE: no stars visible. The next two I do not recognize as real. They look too clean, but hell I haven't seen all the latest suits - but they typically have much more paraphernalia attached. The third , as noted by FIX, is from a movie, and the computer graphics guys who built the scene, could not help themselves, they had to throw in some stars to fill all that empty space. Read the first post link that I suggested. The astronauts, when questioned on this point,(stars in the sky? ), said that they could only see stars when they were on the dark side (of the Earth or Moon), its just too damn bright out there otherwise. Like Tom Hanks said in Apollo 13 (and its true),' the side of yur suit facing the sun is 400 degrees, while yur back side is minus 200'. Everything changes in a vacuum with no atmosphere~!!! Now, on the last two pics; keep the scale and the Math in mind here. The Earth is 8000 miles diameter. 80% of the atmosphere is below 20 miles.. Read that again. The X15 pilots all got astronaut badges for going over 100K feet, (20 miles)because that's out of the atmosphere - for all intents. Now imagine how thick the atmosphere is in that picture of the Earth. Its about as thick in proportion as a wax crayon mark on a baseball hardball. OBTW, I've read in many sources, that if you go down into a well in broad daylight, you can look up and see the stars. the Moon is placed in orbit at exactly the distance from the Earth so that it covers the Sun during a solar eclipse. Isaac Asimov in one of his books commented on the improbability of this occurring by chance. The end, when things do not work out well! Aurelianus, the emperor, having threatened a certain town that rebelled against him, that he would not leave a dog alive therein, and finding the fear he raised, brought them easily to their duty, bid his soldiers go kill all their dogs, and pardon the people. (No Cross, No Crown. P. 325). I have no idea how that post happened again. I have only begun to study this because I have found the conversation interesting. What I have found is that several ancient legends from the Zulu and the American Natives say the moon was towed into place. I don't know what to believe yet, but it seems fairly obvious to me at this point that any official explanation is horsefeathers. yes, the scale makes the atmosphere too thin to register. Likewise, the Himalayas; I did the calc, 8 miles is very much too small to register on the earth's circumference. Again, that is the point of raising it. If we see pics with a visible atmospheric glow (and there are some), then ding ding, such a glow would need to be explained, and casts doubt on the pic. So regarding the stars, I understand the limitation of the camera lens as explanation. The argument is very credible and I don't refute it, but I don't know it to be fact either; I keep an open mind. In the hypothesis that the original pics were faked, and on the 'no stars' basis, then they would have saddled themselves with that rule since then, and would have had to keep faking to that criteria. And in a way, true or not, this is a metaphor for everything on Dots; when the effort by officialdom to maintain a lie just keeps growing, then cracks appear, and we discuss here such inconsistencies when they are observed, and then we connect the dots to try to identify the original lie. It appears that space pics have been consistent since we first went to space, so that badge of credibility has to be noted. But back to Antarctica, our original topic, we sought images from space just to see what the official line was, and found an absence of available pics. In an age where we are generally bombarded with info, an info vacuum is always in itself, a bit suspicious. Just thinking out aloud, to conclude my own thoughts on this. I used to think that Asian's were better at math than their Caucasian counterparts was a stereotype. And if they were performing better at math than your white children it was because of family upbringing. But maybe not? 31.9 % of Caucasians, white people, have the human genome, SNP, RS 3057 for perfect pitch as opposed to whereas 50% of Asians who have it. Perfect pitch means that you can identify any frequency of a note by name. It seems that there is a correlation also between intelligence by people who speak a tonal language like mandarin or Vietnamese vs a non-tonal language like English. Here's is Dylan. He is the son of a musician, record producer, former Professor of Music who is a prolific and very knowledgeable musician in his own right. He has perfect pitch. He also can recite Phi for God knows how long. He also spings Mandarin (yes, taught, not naturally). He also can recite the periodic table, and do a bunch of other things that most kids can't do. Is his talent nature? well, it seem partly. It also seems that his father understood that all babies can hear the sounds that comprise the 6500 different languages in the world, and as english speakers we only use 44. If you make use of this window in a child's development starting at birth, teaching children how to recognize and name sounds, what do you get? Dylan. Besides nurturing this innate faculty in all human's, his father exposed Dylan to high information music. That means complex music with complex melodies and harmonies like classical and jazz vs pop music which is low information music. So if you are thinking of popping out another child into the world and want to give them an advantage in life over the masses, I recommend you swift though this guy's youtube channel and how he trained Dylan. If you're just a normal person and maybe a music hobbyist, play 3 chords on the guitar, I recommend you don't watch any of the video's because you'll learn how much you don't know. But if you are a musician and want to learn stuff you didn't know, especially about ear training and composition, this guy is off the hook. Inspiring and depressing at the same time. Doesn't look so bad. We got this. Don't let us down 2017! You've got some big shoes to fill. FIX, I'm not getting any conflicts on my research into that 'gray tube' you have interest in. See what you can find. I'll gladly look at whatever you uncover. My sources all seem to concur on that picture you found being a PSEP, "Passive Seismic Experiment Package", designed by MIT, and first deployed by Apollo 11. OK, that source makes it suspicious but........ From the APOLLO Mission Report; "Similar to the PSE, except it was self-supporting. This meant it carried its own power source (solar arrays), electronics, and communications equipment. In addition, the PSEP also carried a Dust Detector. " This subject is interesting on sooo many levels. All the evidence suggests that the Moon is artificial and that it's hollow and that it was formed some 2 billion years before the Earth- judging by dating Moon rocks. So, now we look at the (ridiculous)"Big Bang" theory, which suggests that all our near environs in this portion of the Galaxy, should be the same age. So once again this whole 'random act of physics' theory falls apart. The Moon was dragged here by somebody - BUT I'm convinced that the Earth was too. I'm saying, the Earth was consciously constructed in another locale, and consciously brought here. 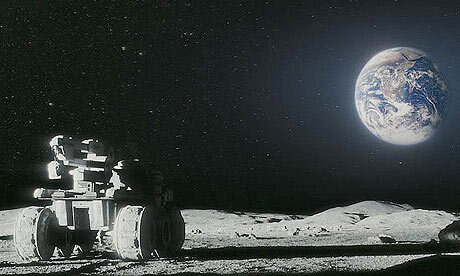 I do not think the Moon was constructed by the same consciousness as the Earth. Look at the evidence. The Moon is cold hollow lifeless. The Earth is brimming with warmth and Life Energy, inhabited by Billions of life forms, in every niche an cranny. All the evidence points to an 'Conscious Intervention' theory of creation/Creator. And I'm very fine with that. In my own current beliefs, there are creator entities - probably Group Consciousness(s) , (the Pleiadian Group suggests that it was the Group called the Lyrans), that actually constructed this portion of the Universe, and that the Annunaki are master engineers(ugh!) in the manipulation of it. At any rate, what we see - 'out there' - the solar system etcetera, I believe is a conscious construction, employing the natural properties of Matter and motion and Time. Its a form factor that works, obviously. I further think that what we observe out there is complicated to analyze, since some of it is not natural - eg. the Moon, and the Rings of Saturn - and that is confounding the research efforts.